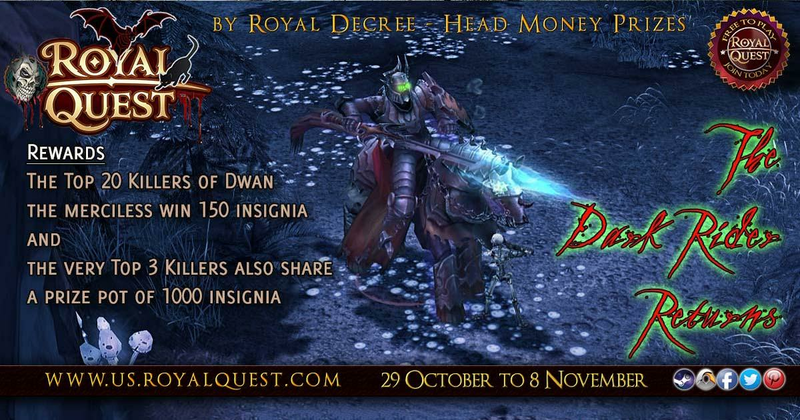 Seeing and appreciating all the efforts of Elenia's brave defenders battling the Dark Rider - Dwan the Merciless, unholy servant of Ngalu, the Royal Treasury announces the rewards for the most valorous and active combatants! 20 of you who take part in the most battles with Dwan the Merciless during the Harvest Festival (any place where the boss spawned) will be awarded with 150 Insignia of Distinction soon after the end of the Halloween event! Also an extra reward of 1000 Insignia of Distinction will be shared between the 3 best Headhunters according to their kill scores and determined by the Royal Quest Events Team. Go ahead warriors! For the King and Elenia! Will we be getting a statistics chart showing player participation or will we receive the statistics at the end of the event? Srsly guys..you are the best. Edited by Moonsilver (Elgore), 06 November 2018 - 01:57 AM. The statistics will be posted at the end of the event! The hunt has been extended until November 15th! ... Does this apply to the "The Chronicles of Pumpkin Madness" Contest Entry Thread? The rewards are nice. However the rewards will not encourage the majority of players to kill Dawn more than once a day. Spending 45 minutes to 1 hour auto attacking a 30 million HP boss for a useless chest. No thanks ~ From most players. 5-10 people are not going to kill Dawn. I only see a large amount of players killing dawn at reset in Elgore. I highly doubt the other 2 get killed. This Event boss has too much HP for this server. Elgore does not have the same amount of players as the Russian Servers to kill this Boas many times and efficiency. As I suggested before. Why not scale the bosses and elites HP based on the number of players attacking. More players higher HP, Less players less HP. Of course, add a minimum and maximum HP cap. Personally, I can do more with that time then to kill a boss that will give the same items I can get from killing a pumpkin items as a reward. Even the card is not very good, although can be split for a few insignia. Also, a few hours after reset, the server is dead, maybe 30 ppl in game. There is no way Dwan is getting killed in an hour at that time. The only new thing in this event is the new costume, which looks really good, but the rest is the same from the last few years. Scaling system itself will not help much. Event bosses are outdated now, just because they were not meant for the "4 chests for best DDs" rule. This rule should not be applied to Dwan, Warrior' Day bosses and Konung. They should drop loot for every killing to attract players - providing most of this loot is an event trash. The event bosses need some sort of scaling system in terms of the total health or the player damage..
One option lower the overall health of the boss when few players are available. If more players show up the health or boss skill increases. The other option for the Dawn event boss specifically is to scale up the player damage. That boss takes way too much time to kill when few people are online helping. This server has a very low population. As stated above no one wants to spend 1 hour at a boss because only 15 people are available to kill it. Fewer and fewer are willing to help kill the boss. Lower the health or raise the player damage on Dawn and more would help. Maybe a translation error or I missed the post about it. We are not suggesting to change the boss loot drops or to change anything related to the chest drop. I agree everyone helping at the event boss should get a chest. The main issue here is that the events are not suited for this server's population. Again, I agree with what DarksKiss is saying. And again, it is not that we want "4 chests for best DDs" rule to apply to the event bosses. The main issue is that it takes too long to kill the event bosses. Edited by Snow-Flower (Elgore), 09 November 2018 - 07:07 PM. Maybe a translation error or I missed the post about it. No, this was my fault. I meant not "4 chests for best DDs" of course, but the "one chest for a character in 24 hrs" feature. I think this is another reason, besides their oversized hp, that makes event bosses unpopular. This should be changed too. Ahhhh now I understand. Yes, One chest per day makes the boss unpopular. The event is once a year so players should be able to get a chest for every kill. More players will help if they get a reward for helping. Are the Results in yet? Has anyone gotten their rewards from the Hunt for Dwan's Head or the The Chronicles of Pumpkin Madness" Contest. I've been sick and away so this is my only way of asking. No. I didn't get the award for the contest. June Hunt: Results and winners!